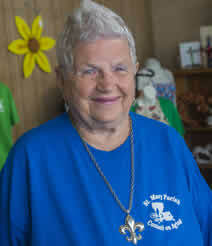 On December 3, 2014, at age 80, Beverly Domengeaux opened the first of three thrift stores dedicated to raising money to feed seniors in St. Mary Parish. The parish’s Council on Aging, where Beverly is director, had a good meal program through its three senior centers, but limited funds meant a limited number of people were fed and too many were left hungry. With the additional thrift-store revenues, the council now serves nearly 4,500 meals a year. Beverly keeps a wish list of things she wants to accomplish to help area seniors. At the rate she’s been making those wishes come true, St. Mary Parish will have model senior and wellness centers with facilities and programs that people in other places could only dream of. There’s more work to be done, but Beverly is looking forward to enjoying the fruits of her labor. She can see retirement coming. But not yet. Maybe when she’s 90. Beverly Domengeaux … Peoples Health Champion.